For months there has been chatter about Honda’s new 5-door hybrid, which has been hyped up as a Prius-killer. However, details have been scarce up until now, when Honda announced (and shared pictures!) 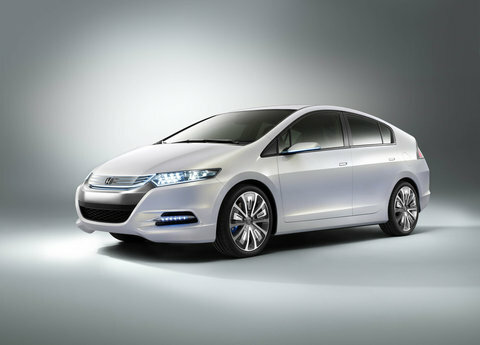 of the Honda Insight Concept, which will be revealed on October 2nd at the Paris International Auto Show. Much has been made of this car because of it’s low starting price (around $18,500) and higher people/hauling capacity when compared to the original Insight. The new Insight’s starting price will be lower than any other hybrid on the market, and was achieved by cutting the cost of Honda’s IMA system, which should lower hybrid prices across the board. If you’ve been following the rumors, you’ll know that the new Insight Concept is based on the stylings of Honda’s fuel cell vehicle, the FCX Clarity, which is now on lease to a few lucky people out in California. This aerodynamics shape allows for a large interior while reducing fuel consumption tremendously, and doesn’t look half bad (I’m sure those wheels won’t come on the production model). Expect to see the new Insight on Honda show-room floors in Spring of next year. Unlike the old Insight (and currently the Prius), we should expect the new Insight to be fairly available for purchase, as Honda intends to sell 200,000 units annually worldwide, with about half of those sales in the US. When more information is available to consumers, I will post again with pictures and links to the Honda site. Honda will reveal a concept version of its new small hybrid vehicle, to be named Insight, at the 2008 Paris International Auto Show, October 2, the company announced today. The new Insight Concept shares styling cues with the Honda FCX Clarity fuel cell vehicle and will provide an early look at the highly-anticipated five-passenger hybrid vehicle. Going on sale in the U.S. next spring, the all-new purpose-built Insight will come to market at a price significantly below hybrids available today. From this unique position in the marketplace, the Insight will advance the affordability and accessibility of hybrid technology to a new generation of buyers. The Insight Concept defines a new stage in the evolution of hybrid technology by utilizing a more cost-efficient version of Honda’s Integrated Motor Assist™ (IMA™) hybrid technology, resulting in a new level of affordability for hybrid customers worldwide. Evoking the innovative styling cues first seen in the FCX Clarity, the Insight Concept is designed with a low center of gravity and a generous five-passenger cabin, offering the kind of driving pleasure and roomy interior that customers have come to expect from Honda. While the Insight Concept’s aerodynamic design clearly identifies its fuel efficient purpose, its five-door access and folding rear seats speak to functionality that is designed to meet the needs of customers with an active lifestyle. The Insight Concept is a small, fuel efficient hybrid car that delivers big style and functionality with a healthy dose of fun. Honda achieved a significant cost reduction in Integrated Motor Assist (IMA) components which should make Insight the most affordable hybrid vehicle to date. The production Insight will be offered as a five-door, five-passenger hatchback. Numerous technologies, including a function to assist customers in achieving more fuel efficient driving habits, will be applied to achieve a further improvement in real world fuel efficiency. With its affordable price, the new hybrid vehicle will represent the best value in its segment. Along with the Civic Hybrid, the new vehicle will be produced at an expanded hybrid vehicle production line at the Suzuka factory in Japan. The Insight is expected to have annual global sales of 200,000 units per year - approximately 100,000 in North America. Following the launch of the new Insight, Honda also plans to introduce another unique sporty hybrid vehicle based on the CR-Z, first shown at the 2007 Tokyo Motor Show. All together, Honda’s global sales of hybrids should increase to approximately 500,000 units a year, or more than 10 percent of its total worldwide annual automobile sales. The original Honda Insight was introduced in December 1999 as America’s first gas-electric hybrid car. The first vehicle to break the 70-mpg fuel economy barrier, Insight was designed from the ground up to demonstrate the ultimate potential for fuel-economy in a two-seater subcompact automobile. A leader in the development of cleaner, more fuel-efficient mobility products, Honda introduced the first low-emission gasoline vehicles; America’s first gas-electric hybrid car and the world’s first EPA-certified hydrogen fuel-cell vehicle, the FCX. In 2007, Honda was named “greenest automaker” by the Union of Concerned Scientists for the fourth straight time.